I read this article and found it very interesting, thought it might be something for you. The article is called Foul Mudammas (Egyptian Mashed Fava Beans with Olive Oil, Lemon Juice, and Garlic) and is located at https://www.anediblemosaic.com/foul-mudammas-egyptian-mashed-fava-beans-with-olive-oil-lemon-juice-and-garlic/. Each year, Ramadan comes about 11 days earlier than it did the previous year because it’s based on the lunar calendar. The good news is, this rotation around the calendar year makes it more fair (so to speak) in terms of the length of day because that’s what determines how long is spent fasting (Muslims fast from dawn to sunset during Ramadan). Meaning, if Ramadan were on a set date, for example, on June 21, people fasting in the Northern Hemisphere would always have to fast a much longer day than those fasting in the Southern Hemisphere (or vice versa if Ramadan were on December 22 every year). Ramadan starts next week. We’ll drink water and eat a small meal before dawn, and then we won’t eat or drink again until sunset when we break our fasts with iftar. And we’ll reflect on what it means to go without; what it means to discipline not just our bodies, but more importantly, our minds. We’ll think about how it feels for the millions of people who go hungry every day, but unlike us, don’t have the luxury of knowing when their next meal will come. We’ll do what we can to help them. In short, we’ll learn and hopefully grow from the experience. So, Foul Mudammas. This is a classic Egyptian dish that’s commonly eaten for breakfast in the Middle East. When I was doing research for my cookbook and Mike and I were living in Damascus with his family, on Friday mornings (which are like our Sunday mornings) Mike’s mom would send him out with a big empty bowl from home to the falafel/hummus/foul vendor down the street. Mike would return to us with a full bowl of foul, steaming hot and ready to be devoured by the whole family. His mom would have an entire spread prepared…juicy ripe tomatoes, refreshing slices of cucumber, fresh mint, and tangy green onions. Labneh (yogurt cheese) topped with a healthy dose of olive oil, plump dates, homemade pickles, olives, fresh soft and aromatic flatbread from the baker across the street, tea, and perhaps halawa. Although Foul is a breakfast dish, it’s not commonly eaten for breakfast during Ramadan because of its tendency to make you very thirsty the next day. These favorites are the meals we try to make before Ramadan because we won’t get to enjoy them for the next month. Recently when the very talented Ksenia of Immigrant’s Table reached out to me with an idea to collaborate on a post, I was thrilled at the idea. Ksenia is a poignant writer, gifted photographer, and healthy recipe developer. Her recipes are innovative, inspirational, and insightful; to name just a few of my favorites, check out her beautiful Russian Korean-Style Kohlrabi Salad with Apples, Radishes, and Spicy Salad Topper, Roasted Cauliflower Steaks on Spicy Sweet Potato Puree, and Middle Eastern Spiced Butternut Squash Pickles. The image of Israeli Green Shakshuka and the image of the Shakshuka breakfast spread are courtesy of Ksenia Prints from Immigrant’s Table. As Ksenia and I were talking over email, our mutual love of Middle Eastern food stood out as a common thread between us. We decided to go with that as our theme, choosing to each share a Middle Eastern-inspired breakfast spread. She made an absolutely stunning Israeli Green Shakshuka, which is vibrant and perfect for spring. Both of our recipes are vegetarian, but they’re completely different in flavor, showcasing the true range of Middle Eastern cuisine. Our dishes are both healthy and nourishing, and total comfort food that works well beyond breakfast, for any meal of the day. This hearty vegan bean-based dish is flavored with cumin, lemon, and garlic, and brightened by the addition of fresh herbs and vegetables. It hails from Egypt and is enjoyed as a traditional breakfast across the Middle East, but it's perfect for any meal of the day. Bring the fava beans (with liquid), chickpeas, and water to a simmer in a medium saucepan over medium heat. Turn off heat and use the back of a spoon to mash some of the beans (about ½ cup) against the side of the pot. Stir in the garlic, lemon juice, cumin, and black pepper. Transfer the beans to 1 large or 4 small serving dishes; drizzle on the olive oil and arrange the tomato, onion, and parsley on top in a decorative way. Serve with lemon wedges to squeeze on top. 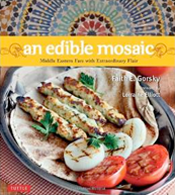 Recipe from my cookbook An Edible Mosaic: Middle Eastern Fare with Extraordinary Flair (Tuttle Publishing; 2012). Disclosure: This post contains Amazon affiliate links to products I believe in, which means that even though it doesn’t cost you anything extra, I will receive money from the sale of these items; thank you for helping to support An Edible Mosaic! Scrumptious and perfect with flatbread. This sounds great (and that whole Friday morning breakfast spread sounds beyond amazing). Glad to discover Ksenia’s blog, too! Faith, thank you for this! What a tender and admirable explanation of Ramadan. I’m happy to better understand what it’s all about. Wow, this sounds wonderful… any tips on making this with fresh favas? I have some I found at the market last week that I’m looking for a special use for… this just might be it! Christina, You could definitely do fresh favas with the same flavors going on in this dish! Just remove the beans from their pods, blanch them for about 2 minutes, plunge into an ice bath, slip off the skins, and then saute the beans in olive oil with garlic for 3 to 5 minutes. Once done, add a squeeze of fresh lemon and any chopped herbs you like! Yes, please. I’ll take mine served in a five gallon bucket. this looks freaking amazing! I also love fava beans, but this is the fist time I’ve seen this recipe. will be trying it next week! This whole spread looks delicious & nutritious, but I CANNOT ignore this amazing food styling. Brava! Faith, this looks delicious! Your photos are gorgeous and I enjoyed reading a little about Ramadan. Thanks for sharing! Absolutely delicious, love the simplicity of your recipe and the flavors! This sounds fantastic! Every time I’ve had “foul,” it’s been whole beans in an herby vinaigrette, so this is super interesting and different! (Clearly “foul” just means “fava beans” or even “beans,” huh.) Definitely going to give it a try! What a gorgeous looking spread! i want to dive right in! We Persians love our fava beans, too. What a beautiful platter you have put together. This looks incredible to eat whether you are breaking a fast or not! I have a deep respect for anyone who observes Ramadan to its completion…it is no easy task especially when you live in a society where the majority of people aren’t observing. I’m sure it’s much easier when everyone you know is also fasting. Love the sound of this dish. Fava beans sound so good! Love these shots, and of course, I’d love to be right in front of that table eating everything on it, too! Such a lovely, and healthy dish…how could anyone not enjoy this? I’m sure these flavors just jump right off the plate. I wish I was eating this for dinner tonight! The flavors of this amazing dish make me want to drool all over my keyboard :) YUM! Ethnic dishes like this are so intriguing. Sounds like a hearty and healthy vegan dish! I don’t normally cook vegan but would totally go for this. What a stunning dish, and thank you for the information about Ramadan. I had a wonderful fava bean dish in Greece a few years ago, so warm and full of flavor. I need to try this dish, the flavor profile is right up my alley. Simply divine. Oooh this looks delicious! So colourful!